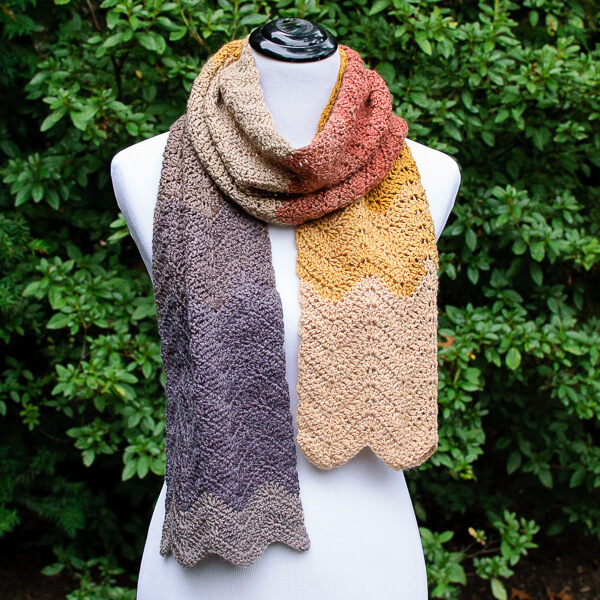 This Autumn Ripple crochet scarf pattern makes for a great project for any experience level! It’s a perfect beginner project because it only takes one stitch and some increases and decreases to get an awesome ripple effect. 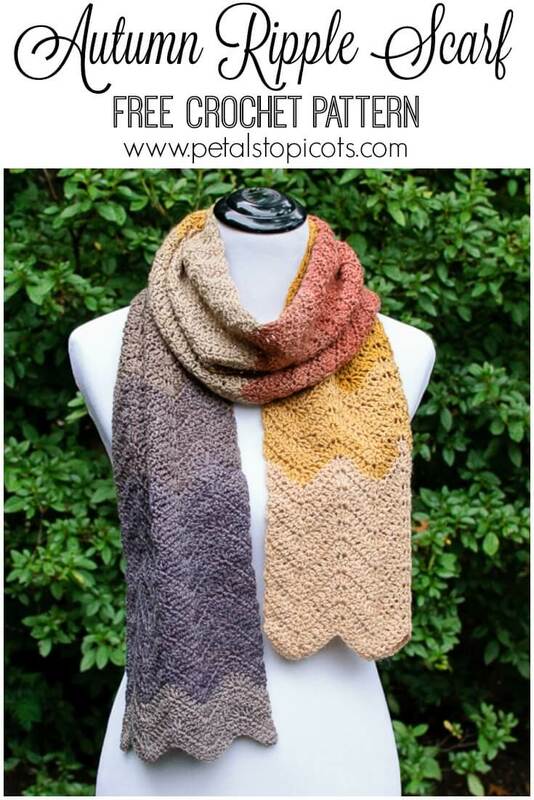 Add in some self striping yarn and you don’t even need to fuss with changing colors! I used Sirdar Colourwheel yarn for mine and it only took one ball to make the whole scarf. This would also work up great with one ball of Lion Brand’s Mandala yarn! I also love how this style works for men and women alike … you can easily make one for everyone on your gifting list! Finished scarf measures approximately 9 in. x 72 in. Row 1: Work 2 dc in 4th ch from hook (skipped chains count as st), *1 dc in each of the next 3 ch, [3dctog over next 3 chains] twice, 1 dc in each of the next 3 ch**, 3 dc in each of the next 2 ch, rep from * across, ending last repeat at **, work 3 dc in last ch, turn – 42 sts. Row 2: Chain 3 (counts as st), work 2 dc in first st (the st at base of chain 3), *1 dc in each of the next 3 sts, [3dctog over next 3 sts] twice, 1 dc in each of the next 3 sts**, 3 dc in each of the next 2 sts, rep from * across, ending last repeat at **, work 3 dc in last st (the turning ch from previous row), turn – 42 sts. Rows 3 through 110: Repeat Row 2 for all rows or until desired length is reached. I’m not sure what you mean by updated … the post contains the full pattern. I’m wondering why the first picture in the FACEBOOK feed shows a much narrower scarf? I would like to do the narrower one. Hi Brenda 🙂 I’m not sure which scarf you are referring to on Facebook. I just see the one pictured in the post here. Your diagram and the written instructions don’t agree. At the end of row 1 you state 54 stitches… yet when I count the stitches (in the diagram), I see 42. Add this to the chain 3 at the beginning and you get the original 45. Am I correct? Hi Christine 🙂 you are correct! Row 1 should end with a total of 42 sts. I mistakenly counted the 3dctog as 3 instead of 1. I have corrected it now. Thanks for pointing this out! I love the look of the scarf but I am following the pattern exactly and I ripped it out three times because it keeps puckering. I’m not sure how to correct this. Help? Hmmm … perhaps your stitches are too tight. I would see if loosening your gauge helps. I would love to make this scarf but am allergic to wool. Any suggestions? Hi June 🙂 Perhaps an acrylic blend of yarn would work best for you. That’s a lovely scarf, I so like the patter plus you know how to combine the yarn perfectly. It’s really awesome. un motif magnifique, merci infiniment ! Multiples of 7 plus 3? Lovely! If I want to make it wider, what multiples do I use, plus how many extra chains? Thank you ! I have a cake of Stylecraft Special Candy Swirl in Blueberry Gum ( DK 484yds ) that has been “waiting ” for the perfect pattern…….This is it ! May I use your pattern for my charity donations ? 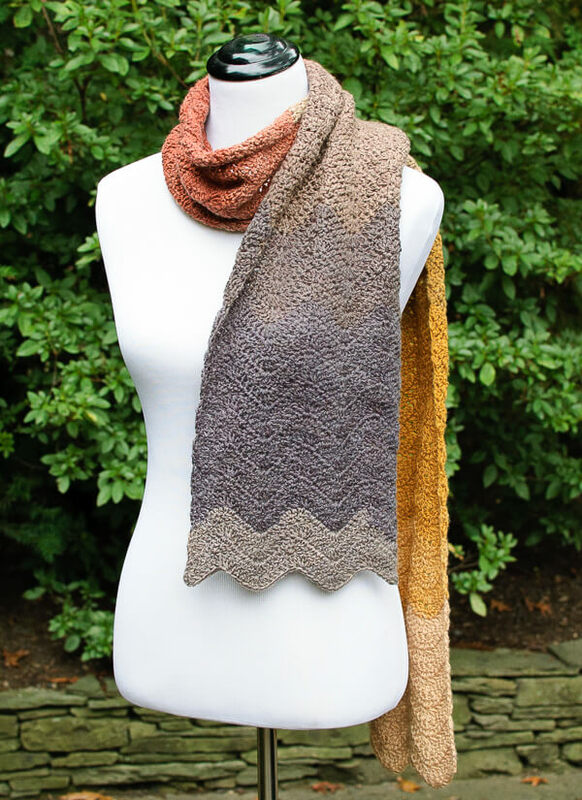 What a lovely ripple pattern and pretty yarn!